Chronicles from Iran » English » Preposterous » Rouhani in Glasgow: A Student at GCU? Hassan Rouhani was very keen to be called “Doctor” from the cradle.The story of Feridoun aka Hassan Rouhani in Glasgow as student. How many lies were told? It is not unheard of for public figures to exaggerate somewhat when it comes to their personal qualifications and achievements. More often than not when discovered these exaggerations can be quickly proven to be true or not; however, claims made by Iranian President Hassan Rouhani have led only to more questions and mystery. 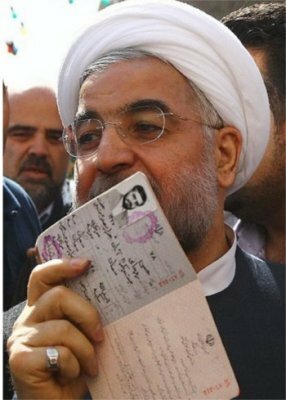 Run-up to the elections: Rouhani had to produce his ID card, Shenasnameh. Rouhani first came to be known in the global media when he ran for the 2013 presidency of Iran and was very much marketed as a reformer keen to rebuild ties with the West. In his own promotional videos (now removed from YouTube) much was made of his education in Glasgow, Scotland. It was originally stated that he attended The University of Glasgow; however, this was quickly challenged and later material stated that he had actually attended Glasgow Caledonian University (GCU). It is here that things become somewhat muddled. Centre of Strategic Research of which he was the president from 1992 to October 2013. The data on him started to inch onto the Net in autumn 2012. Before this time, the Internet was almost void of Rouhani. In the 1970s, he was an active Khomeinist and he can be seen on the background of many pictures from Khomeini. His own propaganda together with several newspaper reports state that Rouhani first studied in Glasgow in the late 1970s at what was then Glasgow Polytechnic (later becoming Glasgow Caledonian University). However, there is very little evidence regarding his study in Glasgow at this time with most of his education believed to have been undertaken at Qom Seminary and the University of Tehran throughout the 1960s and early 1970s. It can only be assumed that this was undertaken sometime between 1977-79 when he fled Iran and was for some time with the exiled Khomeini in France. Hassan Rouhani was elected to the first Majles (parliament) of the newly born Islamic Republic in 1979 and re-elected four more times and was a member of parliament till February 2000. On the Majles files, his level of studies is recorded as “Doctor in Law”. In the Farsi version off Rouhani’s biography (Cf:Rouhani_Wiki_FA), a quote from Jomhouri Eslami newspaper in 1979, at the time under the editorship of Ali Khamenei (the Supreme guide and leader himself) stated his title as “Doctor in Law Sociology”. Hassan Rouhani was very keen to be called Doktor Rouhani from the cradle. Later (date not recorded), it was proved that he had not written a line of a thesis as yet. So he lied to the Majles and his electorate for twenty years. In Islam, drinking alcohol, eating pork and telling lies are under the same heading: forbidden – Haram. But then despite his religious title, Hojat-ol-Eslam, meaning “authority on Islam” or “proof of Islam”, Rouhani is above Sharia. It is confirmed that Rouhani went to Scotland to study and attended Glasgow Caledonian University GCU during the 1990s, receiving a Master’s in 1995 and a PhD in 1999, not as Hassan Rouhani, but under his born name Hassan Feridoun /Fereydoun, recorded in GCU as Feridon. Yet once again there was more confusion as Rouhani states to have received his Master’s in Law and PhD in Constitutional Law, but the university confirm that they issued Hassan Feridon a 1995 Master’s and 1999 PhD in Philosophy. All of these subtle discrepancies regarding the institution, dates and subject studied have created more questions regarding Rouhani’s time in Scotland, with many speculating that he would have studied remotely from Tehran. Throughout the 1990s he was a highly important figure within the Iranian state, involved in many top level committees and one of its top nuclear negotiators. It seems hard to believe that a man with such a high profile governmental position could have also been undertaking a Master’s and PhD at a European university. 1991–present (? ): Member of the Expediency council. 1998–present: Member of the Assembly of Experts. 1989–2013: Representative of the Supreme Leader to the National Security Council. From 1994 to 1999, an over-occupied man of Iranian high politics and security, and known as a negotiator in the Iran–Contra affair (Oliver North – 1980s), was a registered student in Scotland. Hassan Rouhani aka Hassan Feridoun for GCU was a very mature student of 46 years old in 1994, while fulfilling his sensitive political duties in Iran. A peculiar student in Glasgow in the 1990s; it seems that no one was curious. Was discretion the word? Some of our Iranian readers were PhD students in the UK: Oxford, London, Edinburgh, etc. We asked them to describe their student life to us. It all came down to long working hours, many tutorials and much writing and rewriting. Many told us about their friends, their homes, and not least of all, renewing their visas, the right to stay in the UK. In our book, Chronicles from Iran, at some length we covered difficulties in obtaining a visa for the European countries as an Iranian national. In a nutshell: lots of paperwork, meticulous scrutiny on family situation, revenues, and a couple of interviews at the embassy. Since 1979, the consular relationship between Iran and the UK has been on the very difficult side. Many visa applications from students, despite strong recommendations from universities in the UK, were turned down for mere trifles in the papers/certificates. None of this seems to have applied to Hassan Rouhani aka Hassan Feridoun. During the presidency campaign, this picture was published. Have a close look at his Iranian ID picture. 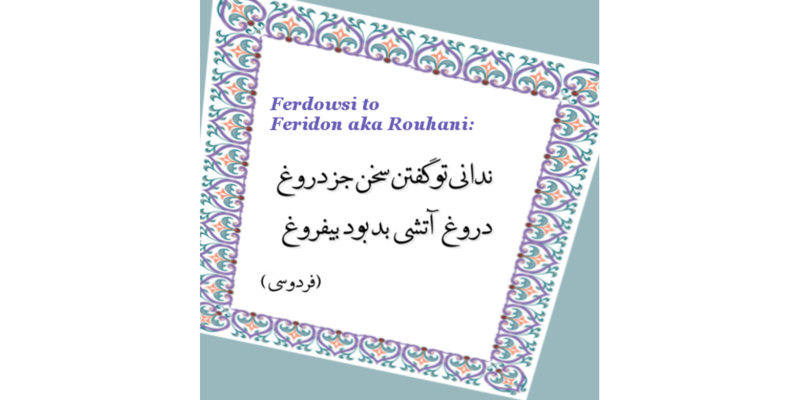 It must go back to 1979, when he officially changed his family name from Feridoun (Fereydoun/Feridon) to Rouhani. Under Iranian law, a citizen must have one and only one ID card. However, in 1994, he seems to have two valid Iranian identity cards and went to Scotland as Hassan Feridoun. Double identity? A criminal offence according to Iranian laws. 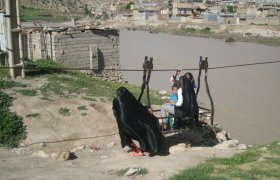 People are known to have been hanged for lesser crimes in the Islamic Republic of Iran. To sum up, in 1994, a 46 year old man showed up at the UK consular services in Tehran, applied for a student visa for GCU and got it. No one seemed to raise an eyebrow. Very convenient. What are the lies about living in Glasgow? There is no word about Mr Feridon student’s life: where he stayed, where he spent his time. Let me speculate. He was a student in Glasgow, a mere 3000 miles (4500 km) from Tehran where he was a member of a half-dozen key committees of the Islamic Republic. In all logic, he would have had to travel frequently, and he would have had contacts within the Iranian embassy in London, not an address to go unnoticed by the British authorities. With high tensions between Iran and the West during this period it seems unlikely that a high ranking Iranian official could study in Glasgow without special measures in place or attracting a high level of attention. However, this is somewhat established by Dr Mahdi Zahraa who works for GCU, and was appointed to supervise Rouhani during his thesis. He confirms that Rouhani was on campus and that they had many face-to-face meetings throughout his studies. 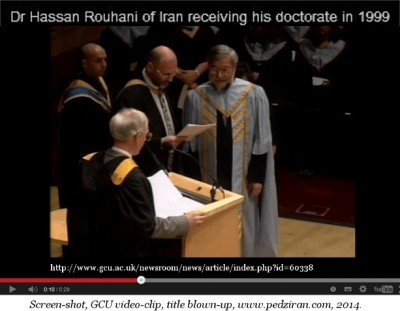 Although there is no evidence of how long Rouhani was in Glasgow for at any time, GCU went as far as to release a 30 second video clip of Feridon now aka Rouhani receiving his PhD; if nothing else all this attention served as a great advertisement for the university. Materials from GCU on Hassan Feridoun were soon to be rectified to Dr Hassan Rouhani and his name to appear in the list of notable staff and alumni. Whereas an average Iranian student gets to know all the acronyms of the UK’s immigration rules and becomes a familiar face to the local receptionists of the Home Office, Hassan Rouhani aka Hassan Feridoun seems to have had a still and serene time in the UK and to have never been concerned with such administrative trifles with the UK authorities. Very tactful. 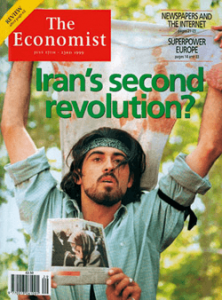 A coincidence: the 7-13 July 1999 student protest in Tehran was crushed in bloodshed; Hassan Rouhani and the then president of Iran, Khatami, played their oppressive roles. On 6 July 1999, the Hassan Feridoun name was published in The Herald of Scotland, among the GCU graduates. Between 1999 and June 2013, Feridoun was GCU’s forgotten alumnus. Then Hassan Rouhani became the president of Iran, and it was revealed that Rouhani had enrolled and studied under a different name, using his family name of Feridoun. This use of his previous name only added to some of the confusion around his studies in Scotland. Interestingly, his PhD cannot be downloaded from EThOS. If the university sources finally cleared up the facts that Rouhani did indeed attend and graduate during the 1990s, more doubt was cast up when it was later claimed that sections of Rouhani’s thesis plagiarised. Only sections of the 500 page thesis were available in electronic form. In his official biography, Hassan Rouhani claims to have published in Farsi, Arabic, and English a total of more than 100 books (at least 20) and papers (at least 80), while supervising some 700 important scientific studies. A breathtaking achievement that merits a reward; a verse of Ferdowsi on lies. All of the controversies surrounding Rouhani’s education were quick to disappear, yet almost every Western article regarding his election was quick to mention his Western education. In his visit to World Economic Forum, Davos, Switzerland, in 2014, Dr Rouhani, the Hojat-ol-Eslam va Moslemin, his official title, was received with unctuous courtesy by the hosts and the journalists. 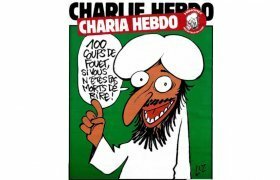 It was as if Western education would instantly back up his reformist claims and boost his ties with the West. This is a trait that is shared by many in his government, which boasts several members who graduated from US universities together with other Western institutions. 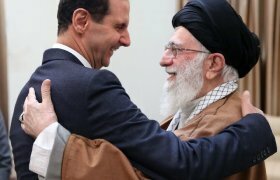 It seems like great propaganda to have so many Western-educated members of Rouhani’s government following the hard-line approach to the West taken by his predecessor, a fact which has been much repeated in the global media. Once more the voters were conned by the rascals, the ayatollahs, and the Supreme Leader, Ali Khamenei. 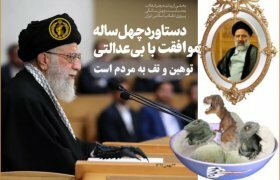 absolute power continues to rest with the Supreme Leader Ali Khamenei and his cronies. Certainly, until something is done to combat his unchallenged rule, all the education in the world cannot save Iran from the destructive path it finds itself on. Post Scriptum: Our deepest respect and gratitude to our correspondents and readers, Iranian and British. They helped us in documenting and in writing this paper.